Wendy had a clear mission when she set to work in the ramshackle two acres of ground around Bosvigo House, many moons ago. 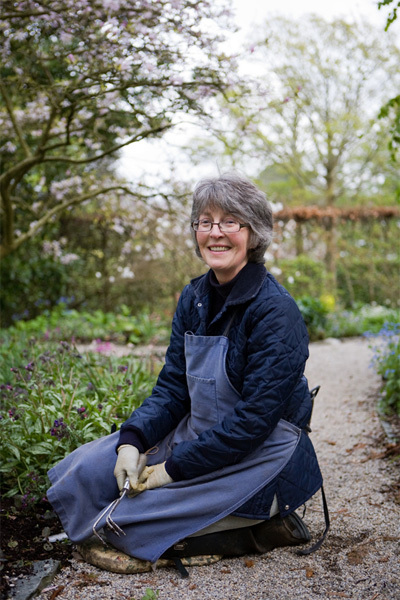 She yearned for a summer garden – yet Cornwall is known for it’s spring displays. She dreamt of a place filled with rare and unusual plants, a balance between the formal and informal, with a series of distinct gardens. Today, summer colour, from muted hues to brilliant splashes, is the glory of Bosvigo, alongside carefully woven spring and autumn compositions to give interest from early spring to late autumn. The name Bosvigo House means the House of Vigo and there has been a dwelling on the site since the twelfth century or before, nothing remains of any house of that early date. Wendy has lived in the house since 1969 and has discovered evidence of seven or eight phases of expansion. e centre bay that is now stuccoed. The two wings were built on around 1780 and they have been extended backwards later. The house was extensively re-modelled by the Victorians who added a huge wing and the Conservatory, inserted a new staircase and landing and made a grand Salon upstairs in the West wing. Since the house was acquired two ugly porches at the back have been removed, extensive restoration inside the house has been carried out and the large wing has been demolished restoring balance to the front façade. The house now resembles the earliest photograph, which is thought to be in 1860.